Nagios can be compiled with support for an embedded Perl interpreter. This allows Nagios to execute Perl plugins much more efficiently that it otherwise would, so it may be of interest to you if you rely heavily on plugins written in Perl. Without the embedded Perl interpreter, Nagios executes Perl (and non-Perl) plugins by forking and executing the plugins as an external command. When the embedded Perl interpreter is used, Nagios can execute Perl plugins by simply making a library call. Tip: The embedded Perl interpreter works with all Perl scripts that Nagios executes - not just plugins. 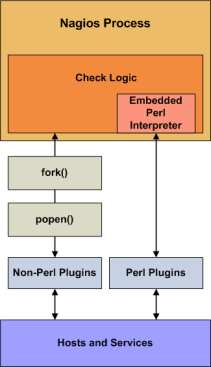 This documentation discusses the embedded Perl interpreter in relation to plugins used for host and service checks, but it applies just the same to other types of Perl scripts you may be using for other types of commands (e.g. notification scripts, event handler scripts, etc.). Stephen Davies contributed the original embedded Perl interpreter code several years back. Stanley Hopcroft has been the primary person helping to improve the embedded Perl interpreter code quite a bit and has commented on the advantages/disadvanges of using it. He has also given several helpful hints on creating Perl plugins that work properly with the embedded interpreter. It should be noted that "ePN", as used in this documentation, refers to embedded Perl Nagios, or if you prefer, Nagios compiled with an embedded Perl interpreter. Nagios will spend much less time running your Perl plugins because it no longer forks to execute the plugin (each time loading the Perl interpreter). Instead, it executes your plugin by making a library call. It greatly reduces the system impact of Perl plugins and/or allows you to run more checks with Perl plugin than you otherwise would be able to. In other words, you have less incentive to write plugins in other languages such as C/C++, or Expect/TCL, that are generally recognised to have development times at least an order of magnitude slower than Perl (although they do run about ten times faster also - TCL being an exception). If you are not a C programmer, then you can still get a huge amount of mileage out of Nagios by letting Perl do all the heavy lifting without having Nagios slow right down. Note however, that the ePN will not speed up your plugin (apart from eliminating the interpreter load time). If you want fast plugins then consider Perl XSUBs (XS), or C after you are sure that your Perl is tuned and that you have a suitable algorithm (Benchmark.pm is invaluable for comparing the performance of Perl language elements). Using the ePN is an excellent opportunity to learn more about Perl. A Perl program that works fine with plain Nagios may not work with the ePN. You may have to modify your plugins to get them to work. Perl plugins are harder to debug under an ePN than under a plain Nagios. Your ePN will have a larger SIZE (memory footprint) than a plain Nagios. Some Perl constructs cannot be used or may behave differently than what you would expect. You may have to be aware of 'more than one way to do it' and choose a way that seems less attractive or obvious. You will need greater Perl knowledge (but nothing very esoteric or stuff about Perl internals - unless your plugin uses XSUBS). Compile Nagios with support for the embedded Perl interpreter (see instructions below). Enable the enable_embedded_perl option in the main configuration file. Set the use_embedded_perl_implicitly option to fit your needs. This option determines whether or not the Perl interpreter should be used by default for individual Perl plugins and scripts. Optionally enable or disable certain Perl plugins and scripts from being run using the embedded Perl interpreter. This can be useful if certain Perl scripts have problems being running under the Perl interpreter. See instructions below for more information on doing this. Once you've rerun the configure script with the new options, make sure to recompile Nagios. Beginning with Nagios 3, you can specify which Perl plugins or scripts should or should not be run under the embedded Perl interpreter. This is particularly useful if you have troublesome Perl scripts which do not work well with the Perl interpreter. Either line must be located within the first 10 lines of a script for Nagios to detect it. Tip: If you do not explicitly use the method above to tell Nagios whether an individual plugin can be run under the Perl interpreter, Nagios will make will a decision for you. This decision process is controlled by the use_embedded_perl_implicitly variable. If the value is set to 1, all Perl plugins/scripts (that do not explicitly enable/disable the ePN) will be run under the Perl interpreter. If the value is 0, they will NOT be run under the Perl interpreter. Information on developing plugins for use with the embedded Perl interpreter can be found here.